The ice cream bouquet at Petite Sweets. There's no question that some food trends can be, well, kind of out there. From the raindrop cake to full-on Lisa Frank-esque rainbow foods (we’re looking at you, Starbucks), these kinds of outrageous fads share one thing in common: fizzling out just as quickly as they mesmerized us all. 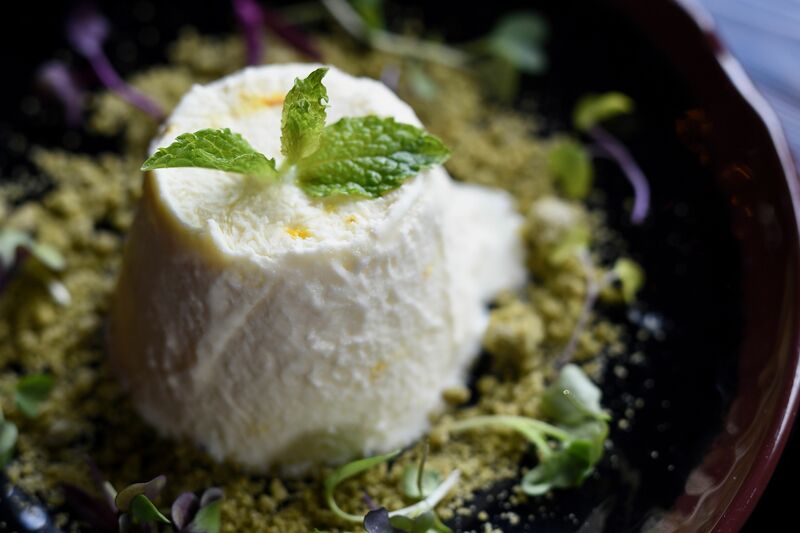 Yet, out of all the franken-creations in recent years, none have been more enduring than those crafted with ice cream and its creamier Italian cousin, gelato. Look no further than hybrid desserts spawned from doughnuts, cookies, waffle cakes, and macarons stuffed with ice cream. Or the Thai treat known as rolled ice cream. And of course, the always-in-bloom rosed-shaped gelato cones from Amorino. Now, Los Angeles’ Gresescent Ice Cream has gifted us with the next made-for-Instagram masterpiece: ice cream bouquets. While not as visually impressive as Amorino’s roses, this frozen arrangement consists of ten tiny scoops, each a different flavor. 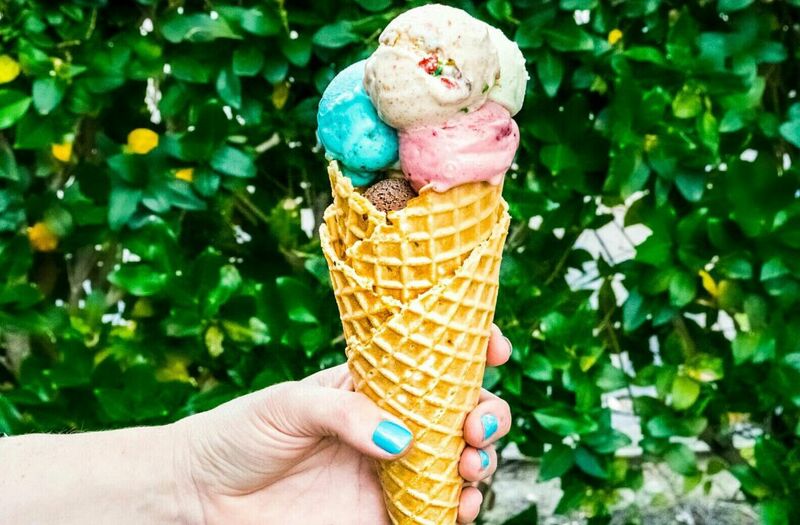 When positioned in a large waffle cone, it resembles a bouquet of flowers. It’s incredibly adorable—not to mention Instagram-worthy. 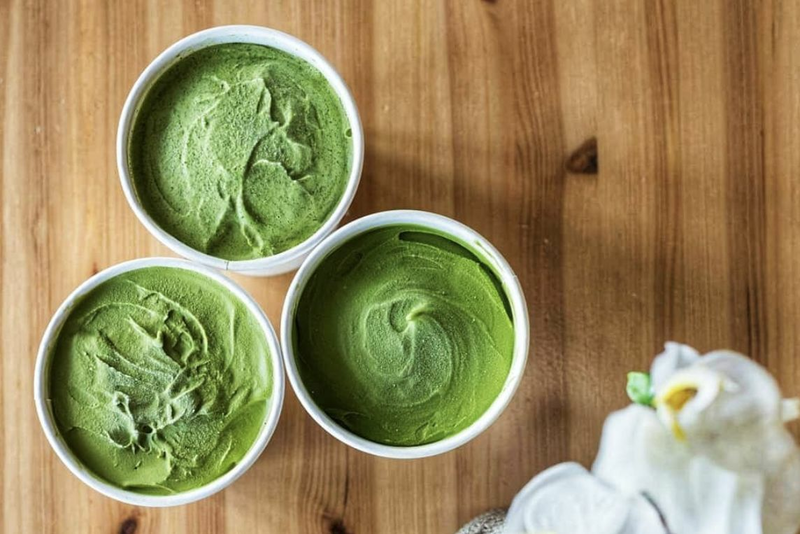 Being slightly obsessed with finding eateries serving up the latest food trends, we set out to locate shops offering the edible bouquet in Houston. Why settle for two or three regular-sized scoops of ice cream when you can get ten mini ones of varying flavors in a cone, right? It seemed like a simple enough task at first, but soon turned into a daunting one. 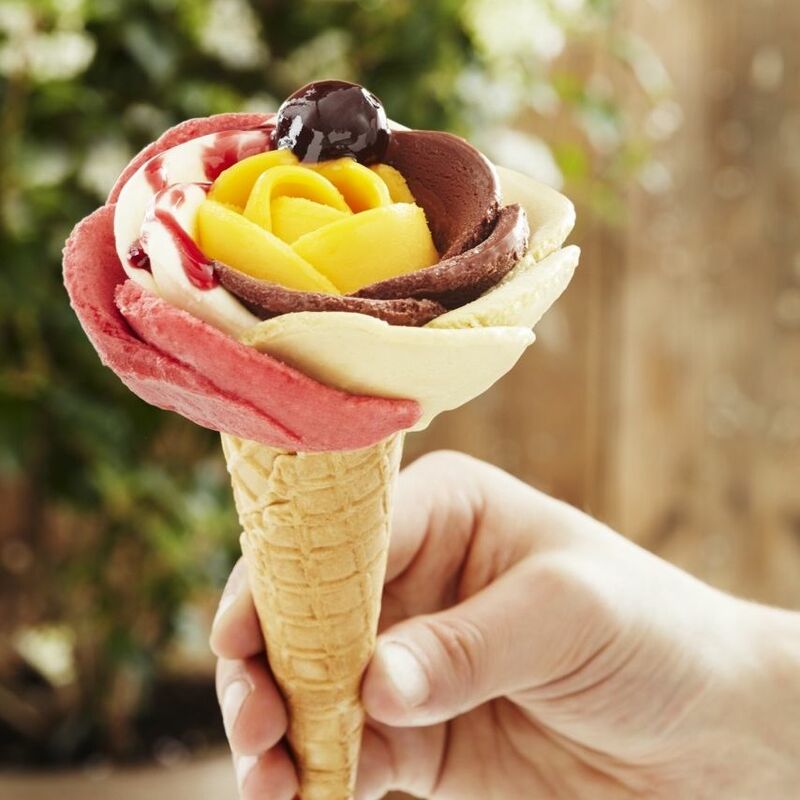 Most shops we reached out to either had no clue what ice cream bouquets were or didn’t know how to make them. It left us asking ourselves, “is it that hard to use a small scooper to create these miniature spherical treats?” Surely not. Feeling somewhat defeated, we stopped by Fat Cat Creamery for a pick-me-up before heading home. The Heights ice cream parlor informed us earlier over the phone that the flower-inspired confection wasn’t offered, still, we decided to treat ourselves even sans bouquet because of our deep love for the icy stuff. Once we made it to the front of the line, we were greeted by Andrew, a 20-something University of Houston student, who cheerfully asked what we’d like to order. Without pause, we whipped out our phones (and crossed our fingers) proceeding to show him the beautiful creations from Gresescent’s Instagram feed. We asked, “Is this something you’re able to make?” With a quick nod and huge smile upon his face, he replied that he could. As it turns out, like us, Andrew’s Instagram feed was filled with photos of Gresescent’s best-seller. He thought the cones were simple enough to recreate and would be a fun addition to the menu. After many test runs at home, Andrew began making the treat in the shop, offering it for the first time a few days prior to our visit. Lucky us. Creating the bouquets does require some skill. Although the college student made the process look easy, it takes a bit of finesse to craft 10 perfect tiny spheres, which is why for now, he is the only one in the shop who makes them. Guests can choose as many handcrafted flavors as they want to build their own bouquets (Waterloo Strawberry Buttermilk is a must), an ideal way for even the most indecisive ice cream lover to enjoy almost everything the dessert shop has to offer at once. 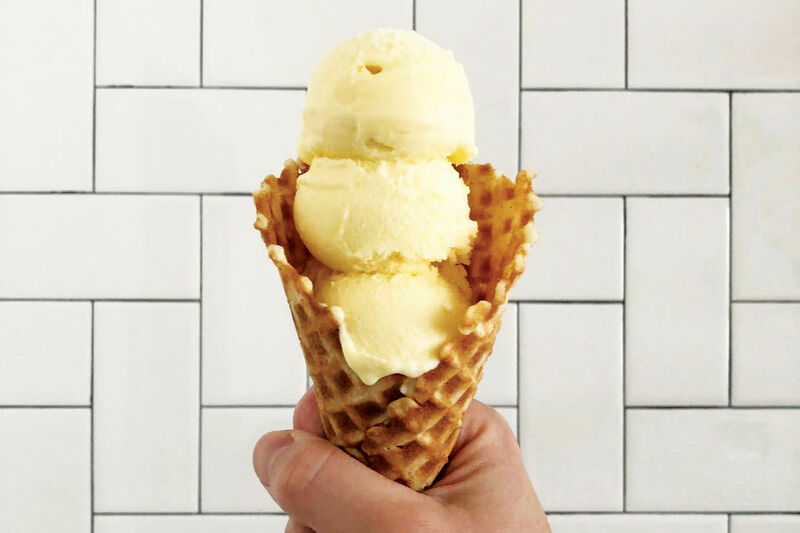 This off-the-menu showstopper is served atop Fat Cat’s housemade brown sugar waffle cones. Some may perceive the $11 (and some change) price tag to be expensive, but it’s actually the same as a three-scoop cone. Continuing our quest to find more ice cream boutiques serving this sweet trend, we reached out to our friends at Grub Club—a group of food loving Houston Instagrammers who make it their mission to seek out every cool new place to eat and snap the most drool-worthy pictures that will have you fighting the urge to lick your screen. They suggested we give Petite Sweets a try next. 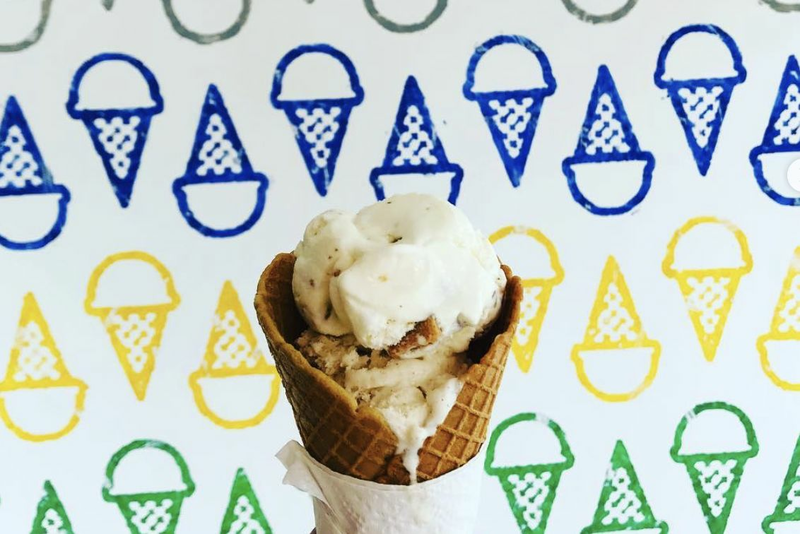 Unlike Fat Cat, this River Oaks one-stop sweet shop from Susan Molzan and Lee Ellis, offers a wider selection of small batch ice cream offerings from their in-house brand, Lee’s Creamery. Patrons can choose as many flavors as they want. During our visit, we opted for strawberry, avocado lime, and other flavors with hues that reminded us of spring. The only qualm might be the housemade waffle cones lacked width, making the creation look less bouquet-like in comparison to Gresescent’s. However, considering the shop is filled with all kinds of baked goods, this oversight can be easily compensated with further customized bouquet options. A macaron- or a brownie-topped bouquet sounds like winners to us. Between the two shops, Fat Cat Creamery’s inspired creation comes closer to the original visually. Granted, the picture we snapped doesn’t show an accurate representation—it was hot, y’all, and between the trip to our car to retrieve our camera battery and set up, the heat defeated our poor cone. Trust us, the cone did come out looking perfect. Both concoctions can be a little messy once the melt factor sets in, but that’s to be expected. Just know, it’s a lot of ice cream for one person, so this could be enough for two. With summer quickly approaching, SweetCup Gelato is just one local shop toying with the idea of ice cream bouquets and flowers. Whether this will be available at its upcoming second location in Oak Forest is still TBD. Will other ice cream shops around town catch on and follow suit? We hope so.